I've become enamored! 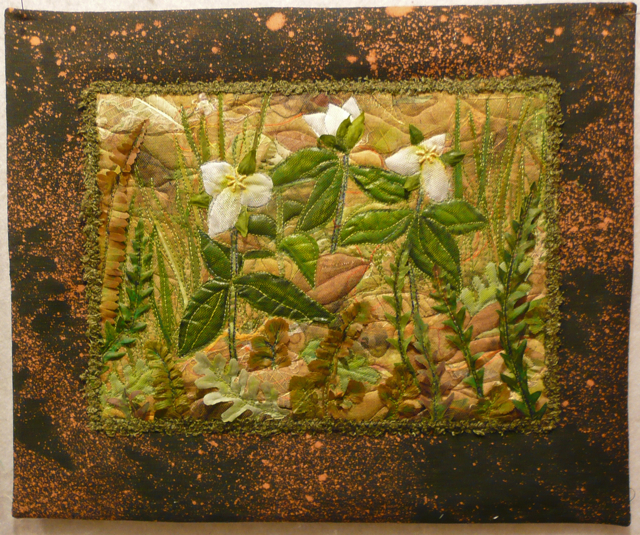 There are two more trillium textile art quilts that I finished and delivered to the Cliff Dwellers Gallery in Gatlinburg this past weekend. Both of these began with my dividing one of the pieces of fabric on which I had made rubbings of huge leaves that were collected along the Mississippi River with gold and silver oil paint sticks back in 2008. ... before they were trapped with a layer of yellow tulle netting. I then machine quilted around the outside edges as well as the shapes and lines. 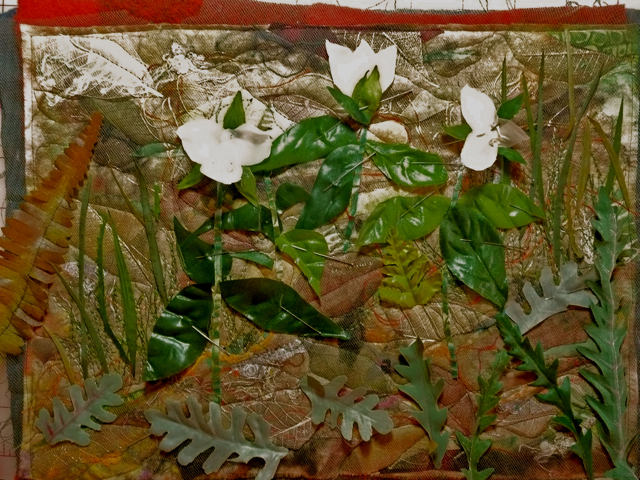 Here you can see I've added leaves, stems, and grasses that were shaped from fabric scraps and disassembled "silk flowers" (collected from thrift shops) to the quilted foundation piece on the right in the picture above. The next step was to trap those pieces with green tulle by quilting around their shapes. The excess tulle was trimmed away between the leaves so as not to "muddy" the background. The border fabric is linen that I discharged a number of years ago. Real fern fronds were scattered across it and then a strong bleach solution was spritzed over all. The bleaching action was stopped by immersing the fabric in a bucket of vinegar and water. At that time I discharged all the yardage I had of this linen with various patterns, some of which was used in "Come With Me to Kasbah" and "Fading Memories". I love the copper color of the bleached areas. I had gone back to the store to purchase more, but it was GONE. 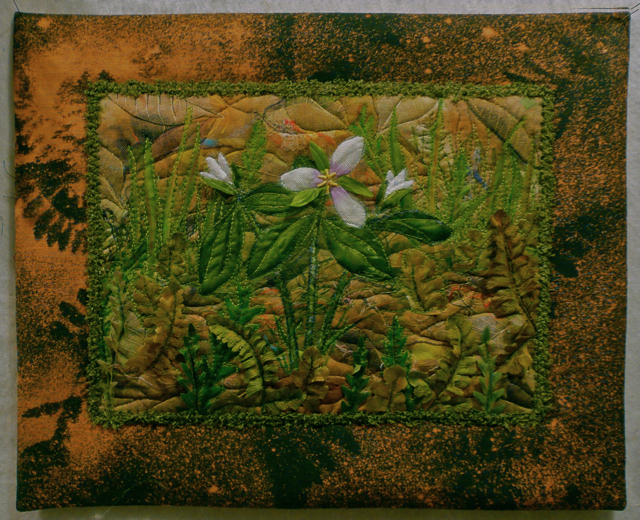 The first hanging, "Trillium Patch #1" sold before it was finished to one of my blogging friends. There are two more foundations using another of those pounded big leaf fabrics layered and laid out to make numbers 4 & 5. I love these!! Nothing says spring like the blooms of the trilliums. Nellie, as always I'm loving your work and your step by step description. I love these two new ones - especially No.3 where the fern leaves are echoed on the framing fabric. It is always so interesting seeing the process of creation. I too love the copper border fabric. These pieces are really lovely. I think Trillium Patch #3 is my favourite! It really looks like the forest floor! Your step by step instructions are also very interesting.